For the fictional character, see Storm Shadow (G.I. Joe). Storm Shadow is a British, French and Italian low-observable air-launched cruise missile, manufactured by MBDA. Storm Shadow is the British name for the weapon; in French service it is called SCALP EG (Système de Croisière Autonome à Longue Portée – Emploi Général, meaning General Purpose Long Range Cruise Missile). The missile is based on the earlier MBDA Apache anti-runway missile, and differs in that it carries a warhead, rather than submunitions. The missile has a range of approximately 560 km (300 nautical miles), is powered by a turbojet at Mach 0.8 and can be carried by the RAF Tornado GR4, Italian Tornado IDS, Saab Gripen, Dassault Mirage 2000 and Dassault Rafale aircraft. 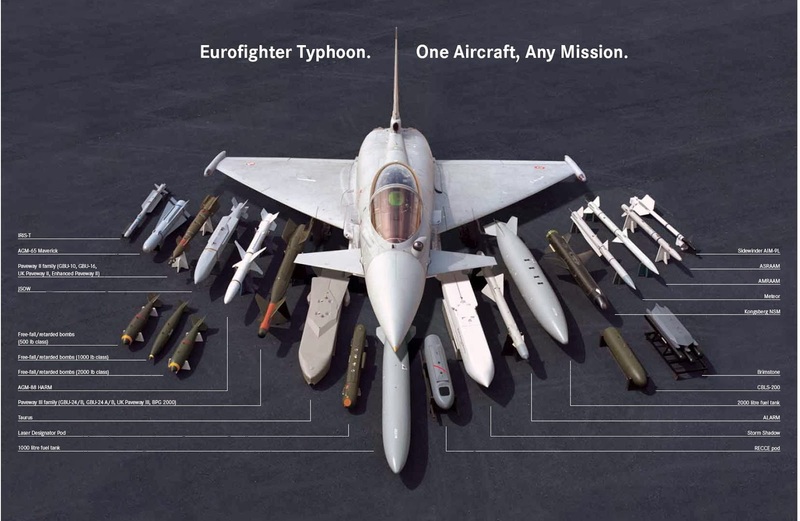 Storm Shadow was integrated with the Eurofighter Typhoon as part of the Phase 2 Enhancement (P2E) in 2015, but it will not be fitted to the F-35 Lightning II once that aircraft comes into service. The BROACH warhead features an initial penetrating charge to clear soil or enter a bunker, then a variable delay fuze to control detonation of the main warhead. The missile weighs about 1,300 kilograms (2,900 lb), has a maximum body diameter of 48 centimetres (19 in) and a wingspan of 3 metres (120 in). Intended targets are command, control and communications; airfields; ports and power stations; AMS/ammunition storage; surface ships and submarines in port; bridges and other high value strategic targets. It is a fire and forget missile, programmed before launch. Once launched, the missile cannot be controlled or commanded to self-destroy and its target information cannot be changed. Mission planners programme the missile with the target air defences and target. The missile follows a path semi-autonomously, on a low flight path guided by GPS and terrain mapping to the target area. Close to the target, the missile climbs and then bunts into a dive. Climbing to altitude is intended to achieve the best probability of target identification and penetration. During the bunt, the nose cone is jettisoned to allow a high resolution thermographic camera (Infrared homing) to observe the target area. The missile then tries to locate its target based upon its targeting information (DSMAC). If it can not, and there is a high risk of collateral damage, it will fly to a crash point instead of risking inaccuracy. Recent enhancements include the capability to relay target information just before impact, usage of one-way (link back) data link, to relay battle damage assessment information back to the host aircraft. This upgrade is already under development under a French DGA contract. Another feature planned for insertion into the weapon is in-flight retargeting capability, using a two-way data link. Storm Shadow will be refurbished under the Selective Precision Effects At Range 4 (SPEAR 4) missile project. Some reports suggest a reduced capability version complying with Missile Technology Control Regime (MTCR) restrictions was created for export, for example to the United Arab Emirates. British Aerospace and Matra were competing with McDonnell Douglas, Texas Instruments/Short Brothers, Hughes/Smiths Industries, Daimler-Benz Aerospace/Bofors, GEC-Marconi and Rafael. The BAe/Matra Storm Shadow was selected on 25 June 1996. A development and production contract was signed on 11 February 1997, by which time Matra and BAe had completed the merger of their missile businesses to form Matra BAe Dynamics. France ordered 500 SCALP missiles in January 1998. The first successful fully guided firing of the Storm Shadow/SCALP EG took place at the CEL Biscarosse range in France at the end of December 2000 from a Mirage 2000N. The first British firing occurred on 25 May 2001 from a Tornado flying from BAE Warton. Storm Shadow entered service with the Royal Air Force (RAF) in late 2001. It was first used during the 2003 invasion of Iraq by No. 617 Squadron. The integration of the missile to the Tornado aircraft had been brought forward "considerably ahead of when it had been planned" as an urgent operational requirement. During the invasion, the RAF launched 27 Storm Shadows. During the NATO intervention in the Libyan Civil War, the Storm Shadow/SCALP-EG was fired at pro-Gaddafi targets by French Air Force Rafales  and Italian Air Force and Royal Air Force  Tornadoes. Targets included the Al Jufra Air Base. and a military bunker in Sirte, the home town of Libyan leader, Muammar Gaddafi. On the 14 December 2011, Italian Defence Officials noted that Italian Tornado IDS aircraft had fired between 20 and 30 Storm Shadows during the Libyan Campaign. This was the first time that Italian aircraft had fired the missile in live combat, and it was reported the missile had a 97 per cent success rate. French aircraft fired 12 SCALP missiles at ISIS targets in Syria as part of Operation Chammal. These launches took place on 15 December 2015 and 2 January 2016. It is thought that these firings may have been approved after a decision by the French MOD to reduce their inventory of SCALP missiles to reduce costs. On Sunday 26 June 2016 the RAF used four Storm Shadow missiles against an ISIS Bunker in Iraq. The Storm Shadow missiles were launched from two Tornado aircraft. All four missiles scored direct hits, penetrating deep into the bunker. Storm Shadow missiles were used due to the bunker's massive construction. The first flight of Storm Shadow missiles on the Eurofighter Typhoon took place on 27 November 2013 at Decimomannu air base in Italy, and was performed by Alenia Aermacchi using instrumented production aircraft 2. In July 2016, the UK's MOD has awarded a £28 million contract to support the Storm Shadow over the next 5 years. In October 2016 the UK Government confirmed UK-supplied missiles were used by Saudi Arabia in the conflict in Yemen. In April 2018 the UK Government announced they used Storm Shadow missiles deployed by Panavia Tornado GR4s to strike a chemical weapon facility in Syria. According to US Marine Corp Lt. Gen. Kenneth Mckenzie, the Him Shinshar chemical weapons storage facility near Homs was hit by 22 "weapons" - US, UK, and French. Nine US Tomahawks, eight British Storm Shadows, three French MdCN cruise missiles, and two French SCALP cruise missiles were launched. Satellite images showed that the site was destroyed in the attack. Head of the Russian General Staff Main Operations Department Sergey Rudskoy, in his briefing for media on 14 April 2018, announced that all eight missiles launched from Tornados were shot down by Syrian Air Defense Forces, a claim denied by the US, UK and France. The Pentagon said that no missiles had been intercepted, and that the raids were “precise and overwhelming”. In response, the Russian Ministry of Defense, during a press conference in Moscow, presented parts of what they claimed was a downed Storm Shadow missile. MBDA developed a longer-range sea-launched variant for the French Navy, called Missile de Croisière Naval (MdCN standing for Naval Cruise Missile), to be deployed on FREMM multipurpose frigates from 2015, and on Barracuda-class submarines from 2018, using the A70 version of the Sylver launcher on the former and the 533 mm torpedo tubes on the latter. As the missile is not launched from a plane, as is SCALP/Storm Shadow, a booster has been included. The submarine version is encapsulated in an hydrodynamic hard container which is ejected when the missile reaches the surface. To provide a comparable range to the BGM-109 Tomahawk, the range of the MdCN (well over 1000 km) is significantly larger than the SCALP/Storm Shadow. The smaller Scorpène-class submarines can also carry the MdCN missile. France originally ordered 50 MdCN for its FREMM frigates in 2006, delivery was expected in 2012. A further 100 surface-launched missiles were ordered in 2009, along with 50 for the planned Barracuda-class submarines. The €1.2bn (FY2011) project was to deliver 200 missiles at a unit cost of €2.48m, or €6m including development costs. MdCN first flight test from a vertical launcher took place on 28 May 2010 and its first submarine launch test took place on 8 June 2011. MdCN's first complete qualification firing took place on 9 July 2012 at the Biscarosse test range. During its third development firing, MdCN met all its test requirements perfectly including the validation of the terminal autonomously guided phase with IR target scenario reconnaissance, which provides the weapon with its exceptionally high precision. On 24 October 2012, MdCN was tested "end-to-end" in the submarine launch configuration for the first time, adjacent to the Île du Levant test centre. The MdCN entered service with FREMM frigates in February 2017. The MdCN was used in its first operational strike during the April 2018 bombing of Damascus and Homs against alleged Syrian chemical weapons production site, in coordination with the United States and United Kingdom, but without approval from the UN. In addition to nine Scalp EG missiles fired from French aircraft, the FREMM frigates Aquitaine, Provence, and Languedoc launched three MdCN missiles. 50 ordered for the Egyptian Air Force in 2015 as part of the Dassault Rafale deal. 500 ordered for the French Air Force in 1998. 50 MdCNs ordered in 2006 and a further 100 ordered in 2009 for the French Navy. As of 2016, France will reduce its stocks down 100 missiles. 90 ordered for the Hellenic Air Force in 2000 and 2003. 485 ordered for the Aeronautica Militare in 1999. Unknown number ordered for the Indian Air Force in 2016 as part of the Dassault Rafale deal. 140 ordered for the Qatar Air Force in 2015. 300+ ordered for the Royal Saudi Air Force in 2006. 600 ordered for the United Arab Emirates Air Force in 1997. Known as Black Shaheen. 900+ ordered for the Royal Air Force in 1997. ^ "La facture des missiles de croisière Scalp s'élève (déjà) à plus de neuf millions d'euros". Marianne. 6 April 2011. ^ "Written Answers to Questions". House of Commons. 17 May 2011. ^ "Storm Shadow". UK: RAF. Archived from the original on 2015-01-03. Retrieved 8 October 2015. ^ a b c d "Storm Shadow". Federation of American Scientists. Archived from the original on 2004-06-03. ^ Hoyle, Craig (28 November 2013). "Eurofighter flies with Storm Shadow missiles". Flight Global. Reed Business Information. Retrieved 28 November 2013. ^ "Storm Shadow dropped from UK's F-35B follow-on integration plan". Jane’s. ^ Handy, Brian (August 2003). "Royal Air Force Aircraft & Weapons" (PDF). DCC (RAF) Publications. Retrieved 18 March 2016. ^ Eklund, Dylan (2006). "Fire and Brimstone: The RAF's 21st Century Missiles". RAF Magazine. pp. 19–25. ^ "Storm Shadow/SCALP EG Cruise Missile". Defense update. Retrieved 8 October 2015. ^ "Defence Suppliers Service" (PDF). UK Ministry of Defence. Retrieved 19 May 2016. ^ "USA angry over French decision to export Apache, Headlines". Jane's Defence Weekly. IHS. 8 April 1998. Archived from the original on 5 June 2011. ^ a b "APACHE AP/ SCALP EG/ Storm Shadow/ SCALP Naval/ Black Shaheen". Missile Threat. Center for Strategic and International Studies. 2 December 2016. Retrieved 15 April 2018. ^ "Missile Technology Control Regime (MTCR)" (PDF). The Center for Arms Control and Non-Proliferation. 2017. Retrieved 15 April 2018. ^ Morrocco, John D. (29 July 1996). "BAe, GEC Snare Key U.K. Contracts". Aviation Week and Space Technology. McGraw-Hill, Inc. p. 64. ^ Evans, Michael (26 June 1996). "£4bn orders will equip RAF for the 21st century". The Times. Times Newspapers Ltd.
^ "£700 Million RAF Contract Signed". The Press Association Limited. 11 February 1997. ^ "France Takes Scalp". Flight International. Reed Business Publishing. 14 January 1998. ^ "Transcript" (PDF). www.iraqinquiry.org.uk. Archived from the original (PDF) on 2016-05-12. ^ "Rafale destroys Libyan jet, as France steps up action". Flightglobal.com. 2011-03-25. Retrieved 2012-09-15. ^ "Libya: France May Shift Rafales from Rafaletown to Sigonella". Aviationweek.com. Retrieved 2012-09-15. ^ "British Armed Forces launch strike against Libyan air defence systems". Ministry of Defence. 20 March 2011. Retrieved 20 March 2011. ^ "U.K. Libya Strikes Include Storm Shadows". Aviation week. 2011-03-20. Retrieved 2011-03-22. ^ "Libye : premier tir opérationnel d'un missile de croisière Scalp par la France". Marianne2.fr. Retrieved 2012-09-15. ^ "UK jets bomb Gaddafi hometown bunker". BBC News. 26 August 2011. ^ "Italy Gives Bombing Stats for Libya Campaign". Retrieved 15 December 2011. ^ Tran, Pierre (7 January 2016). "Engine Support Surges With Rafale Flight Hours, Exports". Defense News. Retrieved 31 January 2016. ^ "Eurofighter flies with Storm Shadow missiles". www.flightglobal.com. Retrieved 2013-11-28. ^ "New contract to support the RAF's long range missiles". UK Ministry of Defence. Retrieved 2016-07-08. ^ "RAF jets strike chemical weapon facility in Syria - GOV.UK". www.gov.uk. ^ "Trump hails 'perfect' Syria strikes". 14 April 2018 – via www.bbc.co.uk. ^ Copp, Aaron Mehta, Tara (14 April 2018). "Coalition launched 105 weapons against Syria, with none intercepted, DoD says". ^ Sputnik. "Брифинг Генштаба ВС РФ по поводу бомбардировок Сирии". ru.sputnik-news.ee. ^ Ewen MacAskill, and Julian Borger (14 April 2018). "Allies dispute Russian and Syrian claims of shot down missiles". The Guardian. Retrieved 14 April 2018. ^ a b c d "Projet de loi de finances pour 2013 : Défense : équipement des forces" (in French). Senate of France. 22 November 2012. Retrieved 2013-11-07. ^ "Premier tir réussi pour le missile de croisière Scalp Naval" (in French). Mer et Marine. 16 June 2010. Retrieved 24 May 2012. ^ "DCNS Scorpène submarine: an unmatched strategic deterrent capability". ^ Jean Dupont (15 June 2010). "Successful First Firing of MBDA's SCALP Naval Missile". MBDA. Retrieved 16 June 2010. ^ Video: First Operational Use of MdCN Naval Cruise Missile by French Navy FREMM Frigates. Navy Recognition. 14 April 2018. ^ "Scalp EG/Storm Shadow/Black Shaheen". Archived from the original on 8 April 2014. Retrieved 7 May 2014. ^ "SIPRI 2017". Stockholm International Peace Research Institute (SIPRI). Retrieved 19 February 2017. ^ "Engine Support Surges With Rafale Flight Hours, Exports". Defense News. 7 January 2015. Retrieved 19 January 2015. ^ "SCALP-EG". Hellenic Air Force. Retrieved 14 April 2018. ^ "Η πολεμική αεροπορία διαθέτει πύραυλο κρουζ". newsbeast.gr. Retrieved 14 April 2018. ^ Shukla, Tarun (23 September 2016). "India signs $8.9 billion Rafale fighter jet deal with France". Livemint. ^ Nathan. "Qatar Emiri Air Force To Get The Full Range of MBDA Missiles for its 24 Rafale fighters 0705152". Retrieved 8 October 2015. Wikimedia Commons has media related to Storm Shadow.